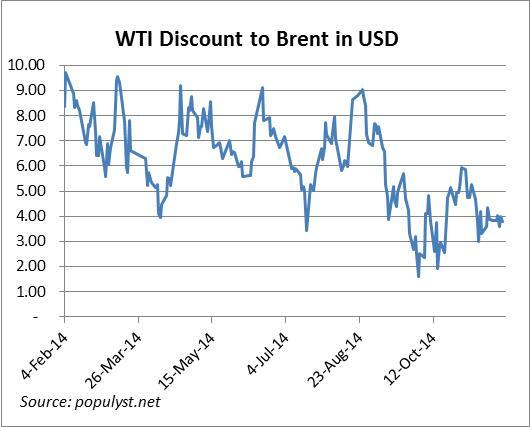 Not until the discount of WTI to Brent disappears. If one of Saudi Arabia’s objectives is to curtail American shale oil production, then it bears to reason that this objective will not be attained until Brent and WTI trade at parity once again. In recent years, the surplus production of American oil coupled with the legal ban on US oil exports has resulted in a discount of WTI vs. Brent. Going forward, there will be no incentive for a domestic oil buyer to replace US oil (WTI) with foreign oil (Brent) as long as the first is at a discount to the second. 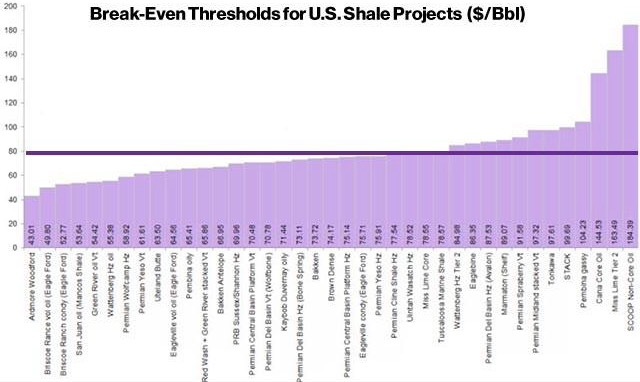 Regardless of the prevailing price, US shale oil production will continue to grow through this year; many wells have already incurred their upfront costs and need the cash flow from production to recoup those costs. When oil was flying high near $100, these operating cash flows were expected to widely offset the upfront costs and to generate an attractive total return for the venture. Now with oil near $50, many will not generate a positive return but they still need the cash flows to get as close as possible. Despite a declining price, there is therefore an incentive to keep pumping for as long as possible. In theory, at current prices, shale production growth will taper off and could even reverse after a few years. This at least is OPEC’s calculation. Markets discount the future and OPEC’s current price war cannot be judged a success until the WTI discount to Brent has disappeared. It appears on its way to doing so, having fallen from a high of $9 and a 2014 average of about $6 to little over $2 today (see chart). 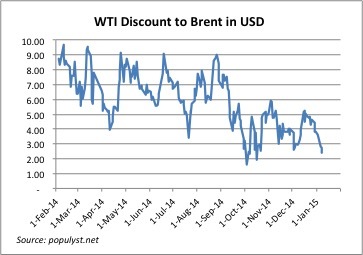 It is a fair assumption that the discount will continue to shrink if the price of oil continues to fall. At $40 or $30, it may disappear completely, But at those levels, there will be other unforeseen consequences. For example, if the US economy weakens due to job losses in Texas and North Dakota or due to more weakness overseas, there would be less demand for oil, resulting in another domestic oil glut and another widening of the discount. Stay tuned. 1- Pressure on US shale oil producers: “Tight” shale oil is more expensive to produce than conventional oil. 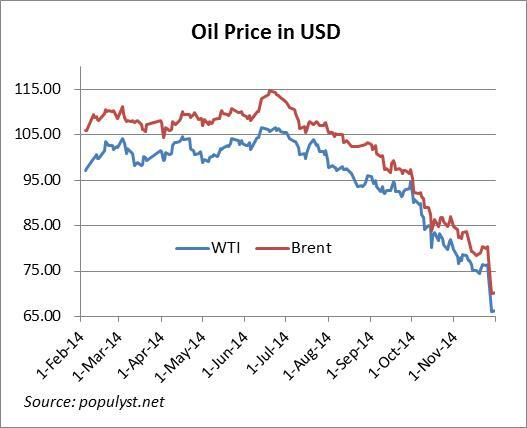 A lower oil price means lower profits for shale producers, or losses in many cases. OPEC’s alleged strategy and gamble are to put some of these people out of business in order to maintain the cartel’s long-term control on pricing. See next two charts. On this, four issues should be considered. 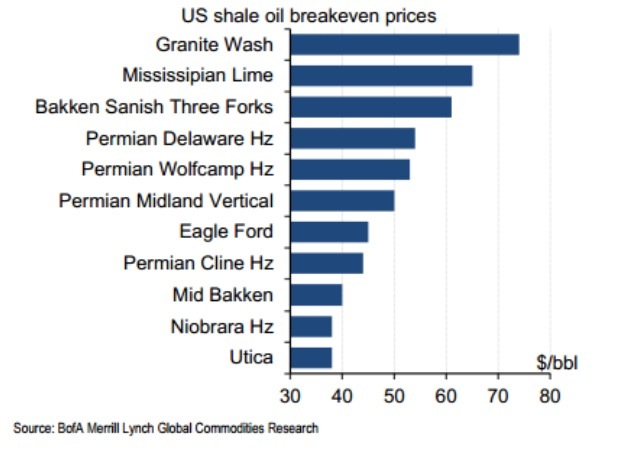 First, the breakeven oil price for shale producers is a moving target. It may be $70 today but it will be lower than $70 in the future thanks to new technology and cost cuts. Second, the breakeven oil price, for example $70 for a given shale well, includes upfront investments which means that the marginal cost of production is lower. In many cases, this marginal cost is below $40 at wells which are already up and running. After the crash, producers will treat upfront investments as sunk costs and will continue to operate these wells for their attractive cash flows. Third, US law does not allow oil exports from the lower 48 states which means that the shale oil produced in the US ex-Alaska must today be processed domestically. OPEC’s calculation may be that the price of Brent will go low enough to displace domestic US producers, but this looks unlikely as long as there is a discount between WTI and Brent prices. If shale oil production slows down, one would expect the discount to narrow and disappear. In fact, factoring in the cost of transport, Brent would have to trade at a discount to WTI, instead of the current premium, before OPEC’s strategy could be considered a success. WTI is still trading at a $4 discount to Brent today, essentially unchanged in the last two months, albeit lower than it was in the earlier part of the year. Fourth, there is some risk of financial turmoil. Several US shale oil producers are highly indebted and will suffer from declining cash flows. Marketwatch has compiled a list of companies that “are in big trouble if oil prices remain low”. “Based on recent stress tests of subprime borrowers in the energy sector in the US produced by Deutsche Bank, should the price of US crude fall by a further 20pc to $60 per barrel, it could result in up to a 30pc default rate among B and CCC rated high-yield US borrowers in the industry. West Texas Intermediate crude is currently trading at multi-year lows of around $75 per barrel, down from $107 per barrel in June. In 2010, energy and materials companies made up just 18pc of the US high-yield index – which tracks sub-investment grade borrowers – but today they account for 29pc of the measure after drilling firms spent the past five years borrowing heavily to underwrite the operations. In the end, a lower oil price may deter some new shale investments, but it will not, or not yet, shutter existing wells. It is difficult to make a case that $70 per barrel is low enough to significantly alter the shale oil dynamic, unless a large number of companies run into financial distress. 2- Pressure on oil-dependent governments: The outcome here may be the difference between a manageable shock for some, and a much more challenging situation for others. 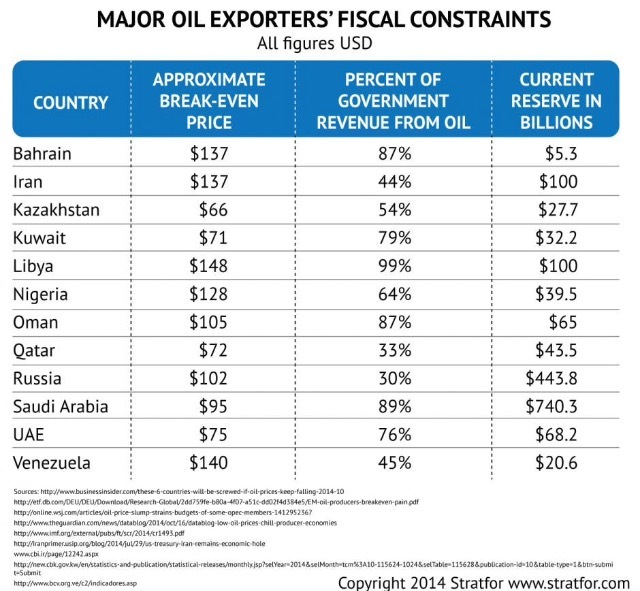 Stratfor has compiled the table below which shows the energy dependence of several government budgets. 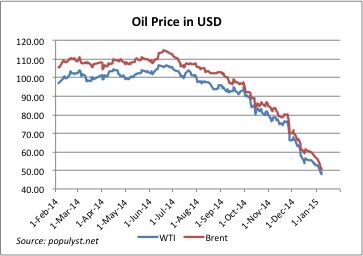 Countries such as Iran, Venezuela and Nigeria need an oil price well in excess of $100. In the right column are each country’s financial reserves which are a measure of each government’s firepower to withstand the shock. Budgets with a high breakeven and low reserves relative to their populations will experience greater strain than others. Venezuela and Nigeria appear vulnerable. Russia will also feel pressure but it has larger financial reserves and a falling currency which will dampen the shock internally. 3- Relief for US consumers and manufacturers: The fall in oil and slower fall in gasoline prices are a clear positive for US consumers. Deutsche Bank analysts estimate that every cent decline in the price of gasoline results in $1 billion of annual energy savings in the United States. A one dollar decline would free up $100 billion every year for investing or spending. 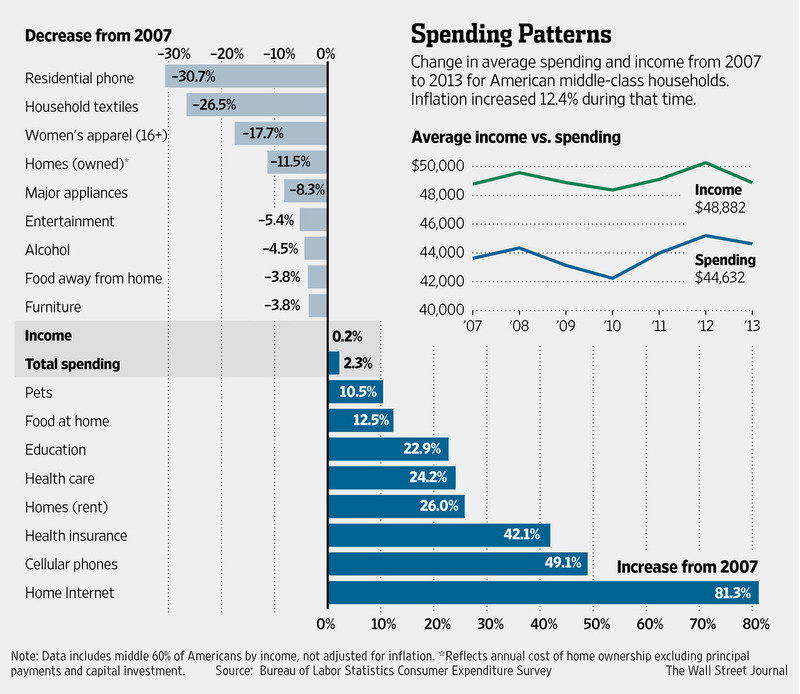 The Wall Street Journal estimates that, since 2007, Americans have underspent on apparel, household textiles, appliances and real estate, all sectors which stand to benefit from years of pent-up demand. More broadly, the US economy will experience a new stimulus from lower commodity prices. All sectors (ex-energy) are beneficiaries but transport and manufacturing companies could enjoy significant windfalls.